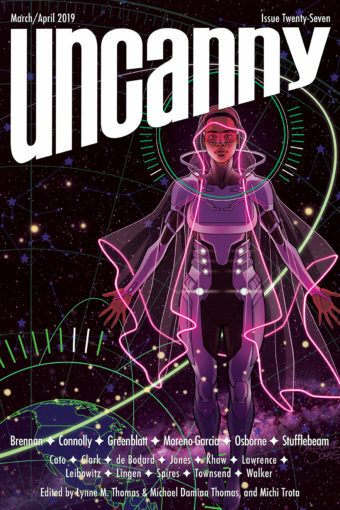 Uncanny Magazine Won a Hugo! So Did Folding Beijing! UNCANNY MAGAZINE WON A HUGO AWARD FOR BEST SEMIPROZINE!!! And “Folding Beijing” by Hao Jingfang (translated by Ken Liu) WON A HUGO AWARD FOR BEST NOVELETTE! We are so honored. This is such a major honor for our first year of publication. Thank you to all of our readers, creators, and staff. This award is only possible because of your support and brilliance. Here are Lynne, Michael, and Michi giving their speeches! And here are Hao Jingfang and Ken Liu giving their speeches! It is all amazing and a little overwhelming. There are articles all over the world for these wins, including China due to Jingfang’s historic win and the Philippines because of Michi being the first Filipina winner in Hugo Award history. You can read Michi’s speech on her website. And Charles Tan made this GIF of Michael!